Original HP 62 ink cartridges and HP papers are optimized to deliver exceptional print quality. When you need lustrous and bright, HP Advanced Glossy Photo Paper can help you maximize the impact of your printing. What’s more, when printed with Original HP 62 combo packs, your prints will be resistant to the negative effects of light, water, and repeated handling. Original HP 62 ink combo packs (K3W67AN) bring your prints to life with vibrant colors and rich blacks when used with your HP printer. HP 62 ink cartridges work with: HP ENVY 5540, 5541, 5542, 5543, 5544, 5545, 5547, 5548, 5549, 5640, 5642, 5643, 5644, 5660, 5661, 5663, 5664, 5665, 7640, 7643, 7644, 7645, HP OfficeJet 200, 250, 258, 5740, 5741, 5742, 5743, 5744, 5745, 5746, 8040. Page yield of HP 62: up to 165 pages tri-color. What's in the Box: New (K3W67AN) Original HP 62 black (C2P04AN) ink cartridge, HP 62 tri-color (C2P06AN) ink cartridge, 30 sheets 4x6" and 15 sheets 5x7" HP Advanced Photo Paper, 10 envelopes. Enhance document quality when you combine Original HP 62 ink cartridges with HP photo paper. Get vibrant, striking color for impressive photos that stand out with Original HP 62 combo packs. Print a variety of fun, customizable photos, flat cards, party invitations, holiday cards, and more. Value pack includes: Original HP 62 Black Ink, Original HP 62 Tri-color Ink, 15 sheets of 5" x 7" photo paper, 30 sheets of 4" x 6" photo paper and ten 5" x 7" envelopes. Yields up to 200 pages in black and 165 pages in color. Ink is smudge and water resistant. Discover new ways to create. Dive into the inspiring idea booklet to explore all you can do. Create without the wait. Easily purchase everything you need to get started in one convenient package. Personalize photo cards and gifts. Unlock your creative potential. Find inspiration with a handy idea booklet and customize your projects with easy-to-use tools and templates. Give family and friends a wide variety of personalized gifts, photos, and cards they'll love. Create photo cards and announcements. Create a wide range of photos and cards for any occasion—party invitations, baby announcements, and more. New ideas for photo projects. 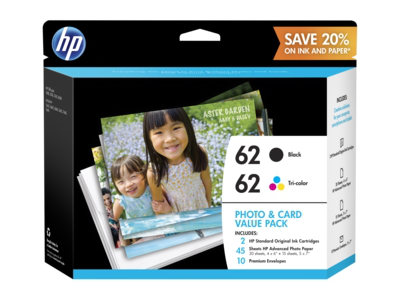 1 Savings compared with individual purchases of HP 62 Tri-color Original Ink Cartridge, HP 62 Black Original Ink Cartridge, and HP Advanced Glossy Photo Paper. Based on estimated retail price of ink and paper if purchased individually. Actual prices may vary. 2 Display-permanence rating by HP Image Permanence Lab. 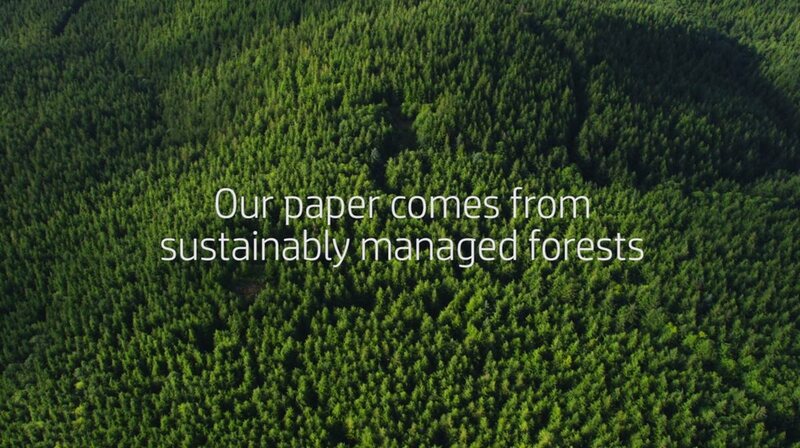 For more information, visit http://www.hp.com/go/printpermanence. 4 For details on local printing requirements see http://www.hp.com/go/mobile printing. 5 Tested in HP Envy 5640 e-All-in-One. Approximate average based on ISO/IEC 24711 or HP testing methodology and continuous printing. Actual yield varies considerably based on content of printed pages and other factors. For details see http://www.hp.com/go/learnaboutsupplies.